23 folks from gathering for the festivities. 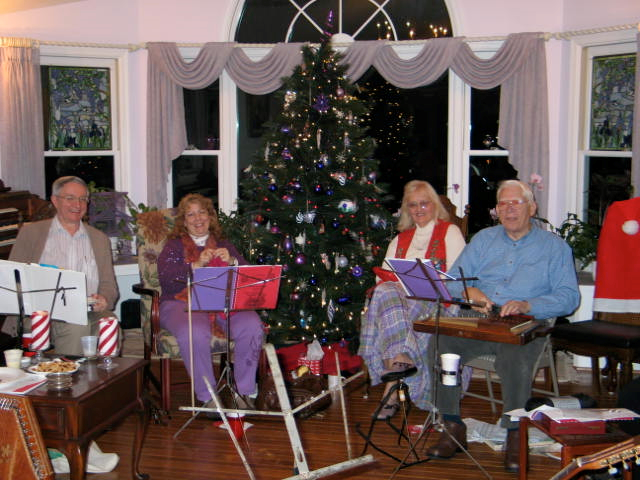 Indeed, it is reported that some 20 brave souls came to the Dettras’ home during the snowstorm on the 5th for their annual mountain dulcimer holiday jam. The Dettras also hosted a gathering of the local Guild of Organists chapter on the 4th, so it was a three-day weekend of music in that house. 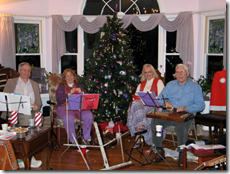 For much of the 3-hour CHAC jam, we played and sang Christmas songs from the collection of interesting and creative, even challenging, arrangements produced by Michael King when he was actively teaching autoharp and participating in CHAC jams. Michael passed away almost four years ago, but his memory lives on in the large volume of melodies that he arranged for various teaching and jamming purposes. Michael was inducted into the Autoharp Posthumous Hall of Fame this year at the Mountain Laurel Autoharp Gathering. Participants were encouraged to bring their own Christmas favorites to share, and these included Beautiful Star of Bethlehem, There’s a Song in the Air, All Through the Night, Do You Hear What I Hear, Pretty Paper, and, of course, Jingle Bell Rock. Upon completion of the jam, all present turned to the bountiful potluck dinner, and the Dettras were left to a quiet house by 6:30 pm. CHAC is not restricted to autoharps…for example, our Christmas Jam had five players on guitar, two on mandolin, and one each on mountain dulcimer, harmonica, and bass; this last was played by Coleen Walters, while Neal was one of the mandolin players. Neal and Coleen came from their home in Greencastle, PA, for both the CHAC jam and the previous day’s mountain dulcimer jam, and Maggie Dodd came from Winchester, VA, for the two days of jamming. We must also acknowledge with thanks the diligent work of Sara Dillich, who served as co-host for the CHAC party.